Comics Impulse v2: The Silver Surfer's Last Ride?!? The Silver Surfer's Last Ride?!? Marvel Knights’ critically acclaimed limited series, Silver Surfer: Requiem, soars the spaceways to its powerful conclusion! The red hot creative team J. Michael Straczynski and Esad Ribic’s bring fans a moving account of the Silver Surfer’s final ride, which has shocked and thrilled fans and critics alike! Now, in the face of impossible odds, the Surfer has crossed the galaxy and arrived at Zenn-La. But what awaits him on his home planet? 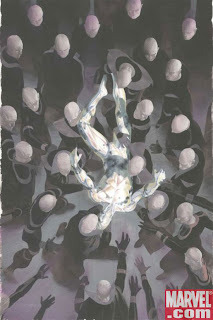 “With the combined talents of J Michael Straczynski and Esad Ribic, Silver Surfer: Requiem is the start of a hauntingly epic masterpiece, which should make a lot of Surfer fans happy,” said Troy Brownfield of Newsarama.com. For untold years, Norrin Radd surfed the galaxy, exploring the darkness between stars, witnessing the rise and fall of vast civilizations. Now Galactus’ preeminent former herald’s ride comes to an end. Don’t miss his last moments on the planet where his cosmic journey began in Silver Surfer: Requiem #4!